When molecules move from higher concentration to lower concentration in a random manner, the movement is called diffusion. The movement of substances through diffusion is a passive transport. Diffusion is a slow process and is not dependent on a ‘living’ system. While non-polar substances diffuse through the membrane, the polar substances move with help of special proteins. This process is called facilitated diffusion. Special proteins help the substances move against concentration gradient and this is energy dependent process. The energy for this is supplied by ATP. Facilitated diffusion happens with the help of proteins which are selective in nature. Such a transport is also sensitive to inhibitors. Carrier proteins form porin channels in the outer membranes of plastids, mitochondria and some bacteria. The porin channels allow the molecules up to the size of small proteins to pass through molecule bound to the transport protein. 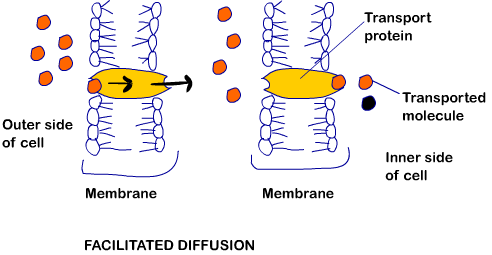 The transport protein then rotates and releases the molecule inside the cell. 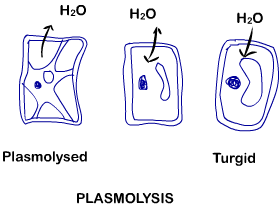 For example; water channels are made up of eight different types of aquaporins. Symports and Antiports: Some carrier proteins allow diffusion only if two types of molecules move together. When both the molecules cross the membrane in the same direction, it is called symport. When the molecules move in opposite directions, it is called antiport. When a molecule moves across a membrane independent of other molecules, the movement is called uniport. Active Transport: Energy pumps are used against a concentration gradient; in case of active transport. Active transport is carried out by membrane proteins. Pumps are proteins which use energy to carry substances across the cell membrane. The rate of transport reaches the maximum when all the protein transporters are being used or are saturated. Water Potential: Water molecules possess kinetic energy. A system with higher concentration of water has a higher kinetic energy or water potential (Ψw). Pure water has the highest water potential. Solutions have lower water potential than pure water. Movement happens from higher water potential to lower water potential. Pressure Potential: If a pressure; greater than atmospheric pressure is applied to pure water or a solution, its water potential increases. This happens because of pressure potential which develops due to increased pressure. Pressure potential is usually positive. Pressure potential is expressed as Ψp. Osmosis: Diffusion of water across a semipermeable membrane is called osmosis. The net direction and rate of osmosis depends on pressure gradient and concentration gradient. Water moves from higher concentration to its lower concentration until equilibrium is achieved. 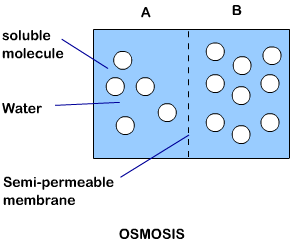 The two chambers across the semi-permeable membrane have the same water potential at equilibrium. When a plant cell is placed in hypertonic solution, the plant cell loses water and hence it loses the turgor pressure. This makes the cell flaccid. The plant cells wilt in this condition. Further water loss results in plasmolysis. At this point, the pressure decreases to an extent where the protoplasm of the cell peels away from the cell wall. This leaves gaps between the cell wall and the membrane. This can also lead to cytorrhysis or complete collapse of the cell wall. Plasmolysis can be reversed by putting the cell in hypotonic solution. When a plant cell is placed in hypotonic solution, the cell gains water and thus gains turgor pressure. This leads to the cell getting swollen. But the rigidity of the cell wall prevents the cell from bursting. Plasmolysis rarely happens in nature and can only occur in extreme conditions. There can be two types of plasmolysis, viz. 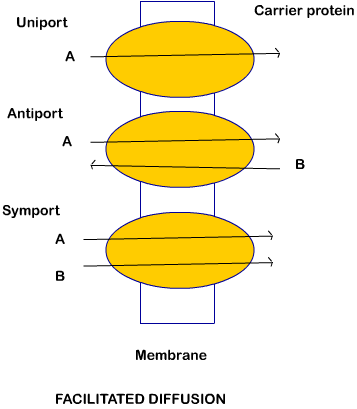 concave and convex plasmolysis. Convex plasmolysis is always irreversible, while concave plasmolysis is reversible. Imbibition: When water is absorbed by solids (colloids), resulting in an enormous increase in volume, this is called imbibition. Seeds swell up because of this process.